Ever since she started playing travel soccer in second grade, Hinsdale Central senior Alex Otto has been told that she’s not good enough. But all Alex keeps doing is proving people wrong. 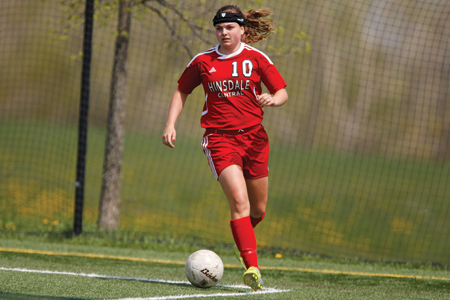 Instead of kicking shots in matches as a 10-year-old, she found herself “picking dandelions on the sideline.” Alex became a top player for the Chicago Blast Soccer Club team but had to absorb the disappointment of not making Hinsdale Central’s varsity team after tryouts last spring. Perseverance paid off when she earned a promotion to varsity three weeks later. And it will yield another reward this fall, when Alex arrives at the University of Alabama at Birmingham campus and fulfills her goal of playing Division I soccer. Alex even had to convince her parents, Shanna and Bill, to let her play travel ball. She did the same thing at Hinsdale Central last spring—after starting the season at the junior varsity level. He did. Alex soon contributed to the Red Devils’ state runner-up finish as a reserve center midfielder, scoring off a corner kick during their 2–0 supersectional win over Carl Sandburg High School, before Hinsdale Central lost to Naperville North 2–1 in the state title match. This season, Alex has moved to center back as the Red Devils’ last line of defense in front of the goal. Michael believes Alabama-Birmingham is getting a talented player who will only get better. Alex, who scored a 31 on her ACT, received an academic scholarship and will study physical therapy.